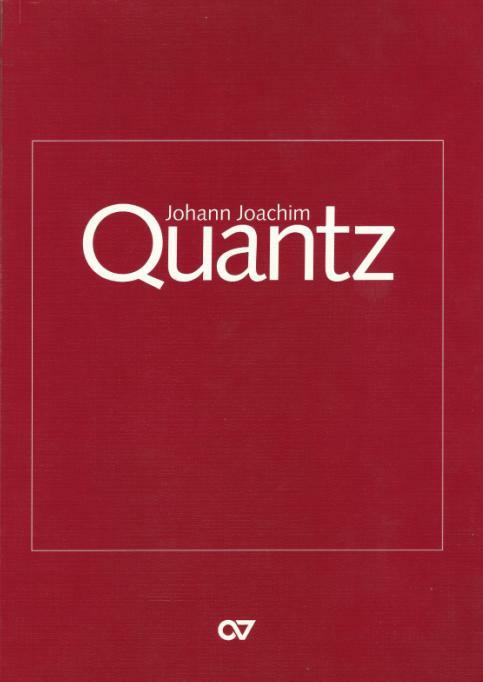 The “Thematisch-systematisches Verzeichnis der Werke von Johann Joachim Quantz”, shortly named the “Quantz-Werkeverzeichnis”, with the works of Johann Joachim Quantz was established by Horst Augsbach. It was published in 1997, coinciding with the tricentennial anniversary of the composer’s birth. The works list contains seven numbered groups: sonatas, concertos with and without violapart, flute solos, trio sonatas, other orchestral works and arias and lieder. The quartets, discovered by Mary Oleskiewicz, were first not included in the Quantz Verzeichnis but were added later. The organization of the works is based on tonality. The largest groups are the sonatas and the concertos. Most works are preserved in the “Staatsbibliothek zu Berlin, Preußischer Kulturbesitz”, “Königliche Hausbibliothek Berlin” and in the “Sachsische Landesbibliothek” in Dresden. QV means Quantz-Verzeichnis. An appendix at the end of each group lists works whose attribution is questioned. (“Anh.” means “Anhang”). Accurate chronological listing of the compositions of Quantz remains beyond present capabilities. Most of the trio sonatas seem to date from the Dresden period, and for the works listed in Frederick’s catalogues, low numbers probably indicate an early date of composition. For more information about the Quantz Verzeichnis see the reference of Mary Oleskiewicz. For the numbers of the concertos in the collection of Frederick the Great and the QV-numbers by Augsbach with additions by Meike ten Brink see the table “Concerts of Johann Joachim Quantz“.